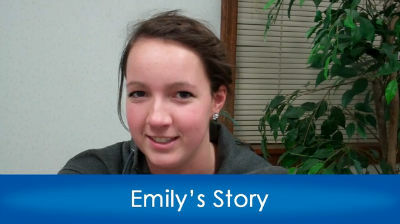 At age 18, Emily is a bright and talented young lady. In her senior year of High School she is also on the school’s swim team, a sport that she could excel, even with no depth perception. 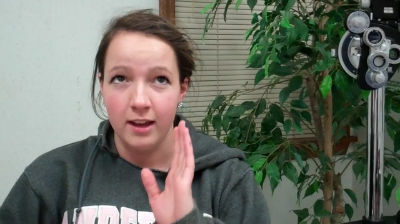 Yes, Emily’s story begins with stereo blindness. It was in June 2012 when I first examined Emily and learned that she had been originally diagnosed with Amblyopia (Lazy Eye) when she was 7 years old. As a little girl, her initial eye examination revealed a type of Amblyopia due to a significant difference in the refractive state of eyes. Her left eye was very farsighted and her right eye had no significant refractive condition. As a result, in these very formative years of her life, her visual brain shut down the input from her left eye resulting in subnormal vision…even with glasses. Her ophthalmologist at the time prescribed the standard treatment paradigm for her Amblyopia, full ophthalmic correction and occlusion therapy (an eye patch for her right eye). A review of her past records revealed that her visual acuity did improve in her left Amblyopic eye, but like many Amblyopic children who are prescribed occlusion therapy treatment, she never gained full visual acuity in the left eye plus she was without 3-D vision, she was stereo blind. Emily is not alone as 1 in 30 individuals will have Amblyopia (3%). While this condition is totally preventable when detected in infancy, the majority of patients are identified after Amblyopia is established. When diagnosed in childhood, a common standard treatment is occlusion therapy – patching the “good eye”. However, as most doctors will attest, compliance is often a problem and even when acuity improves, it often does not remain once the occlusion is discontinued. Furthermore, even with improvement in visual acuity the patient will typically remain with a binocular dysfunction called “suppression”, rendering the patient “stereo-blind”. To make matters more bleak, due to outdated paradigms of treatment that rely on intervention within a “critical period”, as an amblyopic child get’s older, eye doctors will often advise parents that there is little or nothing that can be done to treat the condition if the child is past 10 years of age. So at age 18 Emily presented to me for care as a referral from her primary care optometrist, with reduced (best corrected) visual acuity ranging from 20/40-20/50 and stereo blindness. She wore a contact lens to correct her farsightedness on her left eye, prescribed by her referring optometrist. Yes, Emily knew she could not judge depth, but otherwise truly was unaware of what she was missing. Once we had a diagnosis, our approach was an advanced amblyopia treatment paradigm based on what we know from the latest neuroscience about the visual brain and amblyopia. Studies show that there is placticity even in the adult brain when the emphasis in the treatment protocol is changed from monocular (patching) to binocular stimulation in office-based vision therapy. In addition, not only does this yield better and faster results, but it is also much more enjoyable to the patient thereby eliminating compliance problems. 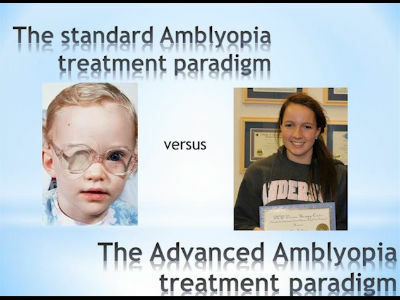 To help doctors understand this advanced Amblyopia treatment paradigm it was my pleasure along with Dr. Lindsey Stull and Dr. Tuan Tran to present to the Annual Michigan Vision Therapy Study Group on February 8, 2013. Our lecture entitled: Advanced Amblyopia Treatment for faster and better outcomes, can be downloaded in a pdf version by clicking the title or viewed in a slide show below. To see the slideshow stream in a video with music just click on the image below. Share the post "Advanced Amblyopia Treatment…for faster and better outcomes"